Glass fusions are fun, beautiful and can bring a whole new dimension to your mosaics. We offer many different ways to learn about and play with fusing glass, either to make elements to work into your mosaic, or to create stand alone beautiful glass pieces. If you are new to fusing, we offer a wide variety of options for creating and playing with glass fusing. Janie Yakovlevitch, our wonderful and lovely fusing director, teaches classes regularly. Fun with Fusing Classes: These classes vary in theme, but typically give you the chance to play with fusing glass as you create specific items, such as pendants or magnets, slumped dishes, painting on glass…. These classes are great for beginners but can also be a fun and productive way for our fusing members to learn new skills. Kiln Rental Program: Our lovely 14” Paragon Glass fusing kiln is available for use by trained members. 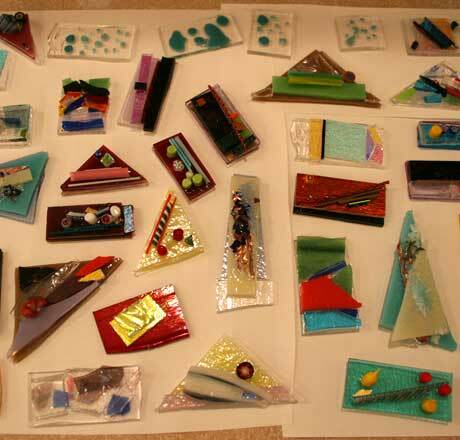 Intro to Glass Fusing or equivalent is a prerequisite for using fusing glass and kiln. Kiln firings can be shared among trained members, but one member must be designated as responsible for payment and filling in the rental sheet with firing instructions.